For mamas who do it every day (and all day, in some cases) every week is breastfeeding week, but the rest of the world needs an annual reminder that breastfeeding is a normal way for babies to get the nutrition and antibodies their little bodies need. That's why the first week in August marks World Breastfeeding Week, an official time to celebrate, recognize and promote breastfeeding and encourage society, governments and individuals to support nursing mothers. Over the last year breastfeeding has been a frequently trending topic in our news feeds. The lack of supports for breastfeeding mothers, low breastfeeding rates and political debates are important factors in the state of breastfeeding in 2018, but we can't forget the stories of individual breastfeeders who are making a positive impact in the world by simply feeding their babies. Let's look back at five women who made the news for normalizing breastfeeding in recent months. Wisconsin gubernatorial candidate Kelda Roys had one of the greatest political campaign videos of 2018, one that proved that breastfeeding mothers have a place in politics. Back in March, Roys told Motherly the moment was unplanned. She was shooting her campaign commercial and her baby got hungry. It was pretty much a simple as that. "Anybody who has a baby knows that you can't really script what they're gonna do," Roys told Motherly. "I was right in the middle of an interview, telling the story, and the baby started fussing," she recalled. "I had that instinct, you know, you hear your baby cry and right away you've gotta get to that baby and feed her—so I just grabbed her and started nursing her." The cameras kept rolling and when it came time to edit the video, she made the decision to include the footage because breastfeeding is a normal part of her life. The resulting commercial ended up going viral and isn't just an ad for her candidacy, but also for the idea that motherhood and political office are not mutually exclusive. Model Adaora Akubilo and her son Arinze made headlines this year when a nursing moment became the highlight of Gap's Love by GapBody campaign. As Akubilo told the Chicago Tribune, the image came about in the same organic was as Roys video did: Arzine needed to nurse in the middle of his mama's shoot. "I'm so comfortable just nursing my son anywhere," Akubilo told the Tribune. "If my son needs to nurse, I'm going to nurse him." The beautiful photo attracted a ton of attention and no doubt helped more people become more comfortable with breastfeeding. Representation matters, and when major brands like the Gap understand that breastfeeding is normal, the trickle down effect is powerful. A couple months after Akubilo showed the world how easy it is to breastfeed in a Gap sleep shirt, celebrity mama Nicole Phelps showed the world how easy it can be to pump in an outfit that's a lot more formal. Accessorizing her evening gown with a Willow breast pump, Phelps proved that pumping is part of the breastfeeding experience for many mamas, and it shouldn't be stigmatized, either. "I want it to be known women don't have to hide in a bathroom to take a moment to provide our babies with food. We should be able to, without judgment nurse/pump (easier with a wireless pump) anywhere we're comfortable," she wrote in an Instagram post, adding that it can be physically difficult for moms to pump when they feel they have to hide to do it. We shouldn't have to miss out on life's important moments so that we can provide our babies with the milk they need. 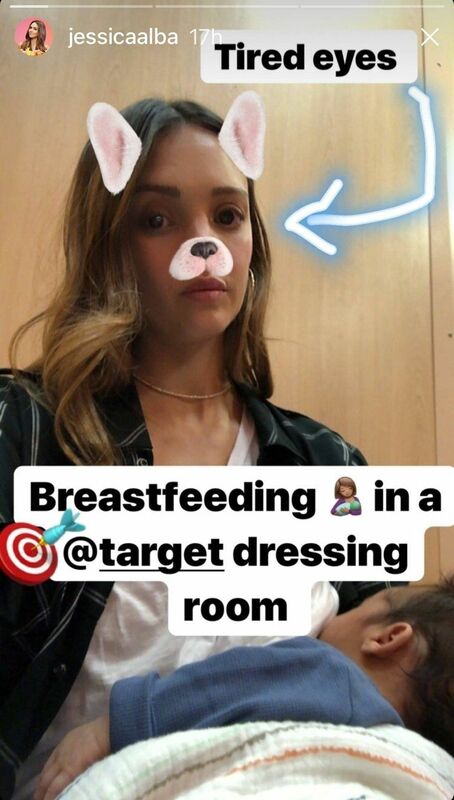 Jessica Alba is a movie star and a successful business woman, but earlier this year she was also another tired mama taking a breastfeeding break in a Target fitting room. The private moment made headlines after she shared it on social media, and Alba also recently shared with Motherly that several months after this snap, she is no longer breastfeeding. Like so many mamas, she first started supplementing with formula before weaning completely. "I felt like he wanted to nurse 24/7, which was obviously really challenging when you're trying to go back to work," Alba told Motherly. "Also my milk supply was challenged with him." These are challenges that so many breastfeeding mothers face, and as we celebrate World Breastfeeding Week it's important to remember that it isn't always easy, and that infant feeding doesn't have to be an all or nothing venture. You can breastfeed and bottle-feed if you need to, mama. Fed is best. Alba proves there is no shame in that. When model Mara Martin hit the runway in the 2018 Sports Illustrated Swim Search show, she brought along a special guest. Her her 5-month-old daughter Aria accompanied Martin down the runway so that she could keep breastfeeding, and the moment went viral. "It is truly so humbling and unreal to say the least," Martin wrote in an Instagram post after she woke up to see her name in headlines around the world. "I'm so grateful to be able to share this message and hopefully normalize breastfeeding and also show others that women CAN DO IT ALL! But to be honest, the real reason I can't believe it is a headline is because it shouldn't be a headline!!! My story of being a mother and feeding her while walking is just that." Yes. Moms can wear bathing suits and breastfeed a baby. It's not shocking news, but in a world where women are still being asked to leave swimming pools for breastfeeding their children, a very public combination of swimsuit wearing and nursing is something to celebrate. Here's to all the mamas who made headlines for breastfeeding in 2018. If World Breastfeeding Week does what the World Health Organization intends, one day feeding our babies won't be notable. It'll just be as normal as it already feels to all the mamas who are doing it.